The joint Alaska Airlines Negotiating Committee opened negotiations with Alaska Airlines management this week in Seattle, Washington, at the SeaTac DoubleTree. Represented by the Company were: Greg Mays, Vice President/Labor; Wayne Newton, Vice President/AOCS; Jason Berry, Managing Director/Cargo; Constance von Muehlen, Managing Director/M&E; Denise Kliskey, COPS Labor Manager; and Maranda Rosenthal, Senior Attorney. 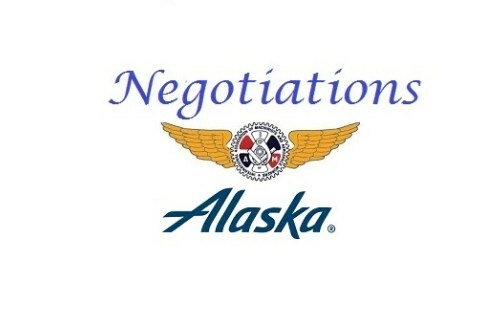 Joining your Negotiating Committee were: James Carlson, Assistant Airline Coordinator; Kris Hannah, Grand Lodge Representative; and Brianna Gregory, Special Representative. During the week, your Committee presented “Openers” for the RSSA and COPS agreements, respectively. The Company, though, only presented openers for the agreement covering RSSA. Again, your Union believes we have the right to negotiate the COPS agreement alongside the RSSA agreement. We know that the best agreement for both groups can and will be reached by sticking together and negotiating as one unit. Despite the disagreement regarding COPS openers, the Company and your Committee have already made progress in achieving the contracts the Alaska IAM membership deserves in reaching Tentative Agreements for Article 9 (Seniority) and Article 10 (Vacancies) under the RSSA agreement. Near the end of our session, the Company presented their proposals for Article 16 (Grievance Procedure) and Article 17 (System Board of Adjustment). Your Committee is pleased to have received proposals on two Articles of language that will be common between both the COPS and RSSA Agreements. We will take the time necessary to review these proposals, and plan to respond appropriately. The next negotiations session is scheduled for November 1-3, 2017 location TBD. There is one source of official communications regarding these negotiations – that is those issued by your Negotiating Committee. Remember: United we stand, divided we beg.